like that in my pickup truck back in the States without even thinking but on a motorcycle it’s a different thing. You feel every mile. Or, in the case of the CBF’s handlebar buzzing, you don’t feel it. 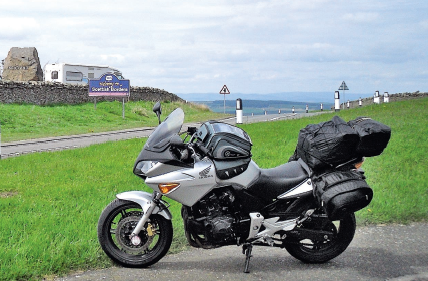 The ride from Cardiff to Borrowdale wasn’t easy – 300 miles was the greatest distance I’d ever ridden in a single day. Because I am American, I decided to take the motorway. Because this is Britain, I spent nine hours crawling through work zones and narrowly avoiding death at the hands of inattentive BMW drivers. When I finally arrived at my hostel in the Lake District, I was so tired I almost fell off my bike. I started riding in Britain when I got sick of driving – narrow roads, too many roundabouts, too much traffic – and sold my car for scrap. What I didn’t process, though, was that something was missing in my life: a something I can’t really define. I need to go. “Go where?” my wife used to ask. I don’t know. Nowhere. Anywhere. I just need to be going there. Maybe it’s an American thing: our fanatical devotion to the concept of freedom. Without it, I felt miserable. I’ve never been the world’s most emotionally stable person, but without the solace of movement I slipped deeper and deeper down the well. And all those cliches that celebrities have ghost-written into their autobiographies? I’ve been there. I’ve practiced tying knots. I’ve enjoyed the view from high bridges. So I started riding bikes. Despite my numerous delays, I arrive at my hotel with plenty of daylight left to clean and lube the bike’s chain. Because I am the sort to over-prepare I have brought a torque wrench with me to adjust the chain. Because I ride a Honda there will be no need to use it. The late afternoon sun is strong enough that I strip down to just two layers and sweat as I work on the bike. I choose a route back that will take me through Northumberland National Park. As soon as I’m south of Edinburgh the road is delightful. The cold of the wind is cutting across this barren landscape but there is something about the space that makes my heart jump. The roads of Northumberland are incredible. I’m able to hit everything at speed and see all the way through the curve; there are no hedgerows or trees to block my view. Next day I pick up the A483 and it feels like a victory lap. South of Newtown the road gets stupid curvy. All those “best biker roads” books mention this stretch. In the United States, a road like this would be given an ominous name like “Devil’s Highway” or “Widow’s Alley.” In Wales, it is the A483. Swooping, diving, leaning, accelerating, pushing toward home I feel connected. To the bike, the road, this place, and my place within it all. Connected, not confined. There are no stops, no limitations. This piece of metal, this secondhand Japanese machine, will take me anywhere I want to be. I am free.